Traditional pasta roller lets you make the freshest pasta you've ever tasted right at home. Made of heavy duty, shiny, chrome-plated steel, the 6-inch wide roller with double cutter head makes thin spaghetti and wide fettucini noodles with an easy-lock adjustment dial and a wooden grip handle to easily crank out dough. Additional attachments for a variety of noodle shapes are available separately. 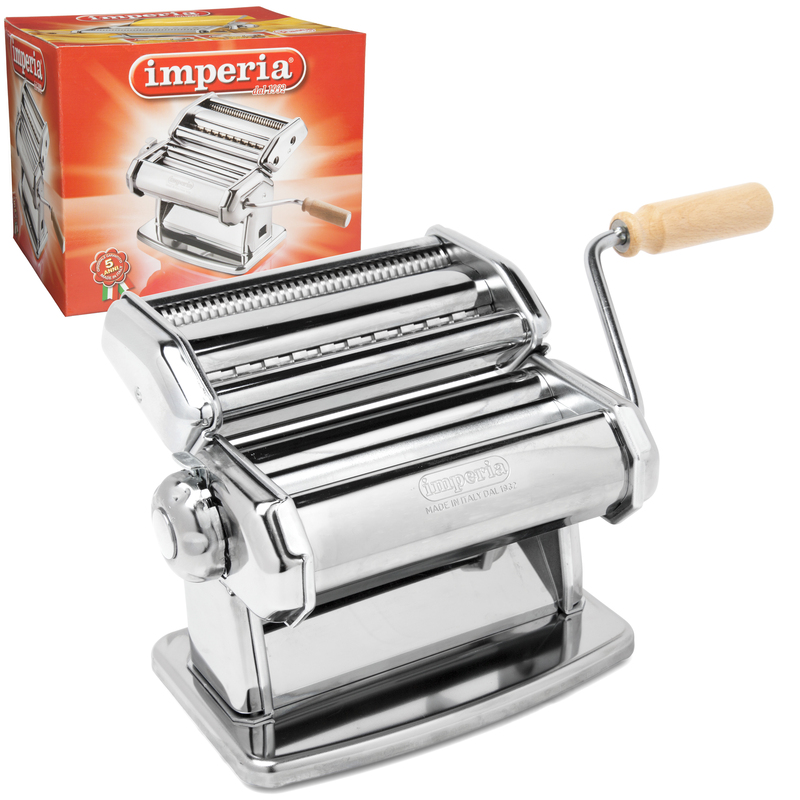 The Imperia Pasta machine has quickly become the #1 leading homemade pasta maker and with great reasons. Well-built, long-lasting, easy-to-use, and it makes the most delicious pasta you will ever taste! Some say even better than what you'll find in top grade Italian restaurants. Boasting countless 5-star ratings on Amazon and having a massive underground following of Imperia fanatics, the Imperia pasta machine is the Rolls Royce of pasta machines. The Imperia Pasta Machine is not just a thing of great beauty; it's an object of supreme practicality, from it's solid steel and wooden cranking handle right through to its sturdy, steadfast table clamp. This is Italian high-end manufacturing and craftsmanship at its absolute finest. Whether you are looking to make fettucine, farfalle or conchigle with your Imperia pasta maker you'll find the right model and the right attachment you need. Plus, every Imperia machine comes gift-boxed and complete with your own pasta recipe book which you'll be able to use to stun and amaze your dining guests with wonderful culinary experiences that will live long in the memory. The pasta you create with an Imperia machine is unlike any other - the perfect thickness (you choose it), the perfect consistency and heavenly to taste this is not just pasta.